Haiku is OpenSource operating system, also known as OpenBeOS. Haiku is aiming to be an opensource continuation of discontinued operating system BeOS. Haiku can run on x86 or PowerPC based computers and it's designed for desktop use, but it's still in development. If you want to know more or try Haiku by yourself, visit Haiku's homepage by clicking here. 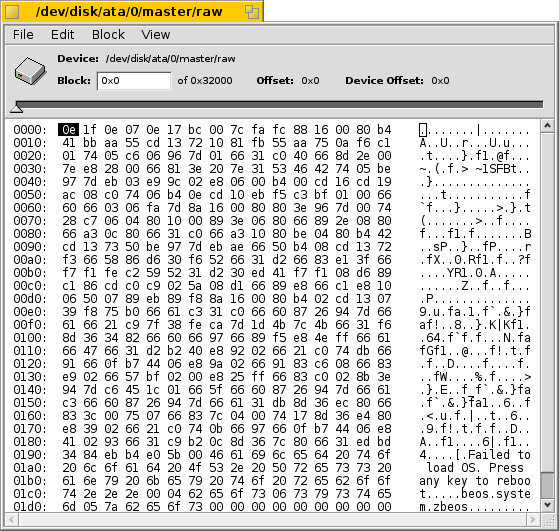 On the screenshot: Application for a hexadecimal view of data on a harddrive.